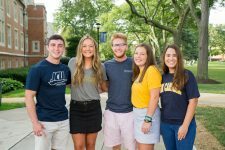 John Carroll University has many department, donor, and alumni-supported scholarships based on various criteria such as intended major or geographic area. Those scholarships requiring a separate application below are indicated in blue font. For scholarships that do not require a separate application, every accepted student who meets the criteria will be reviewed by the Financial Aid Committee. These funds are awarded to incoming first-year students only and are renewable for an additional three years. The deadline to apply for these awards, unless otherwise noted, is February 1, 2019. Decisions will be made by March 1, 2019. Awarded to an incoming freshman student who intends to pursue a business major. This scholarship is awarded to African American and Hispanic Pell grant recipients enrolled in the Boler College of Business. Awarded to an incoming freshman intending to study in the Boler College of Business with strong academic performance and financial need. Awarded to two incoming freshman intending to study in the Boler College of Business with financial need. This scholarship is awarded to an incoming freshman, who is majoring in History or Education, with unmet need, based on appeal. An application is required for this full-tuition, four-year scholarship available to incoming freshmen who have studied Latin at the secondary level for at least three years and intend to major in Classical Languages at JCU. Many recipients of the Castellano Scholarship also major in a second field of their choice in addition to classics. In order to retain the scholarship, students must enroll in a Latin or Greek class each semester and maintain a 3.0 average in the major and overall. This scholarship is designed to strengthen Ohio’s competitiveness within Science, Technology, Engineering, Mathematics, and Medicine (STEMM). Students must be Ohio residents intending to major in a STEMM discipline (Biology, Chemistry, Computer Science, Exercise Science, Mathematics, Physics, or Neuroscience) at JCU. An application is required, and recipients are required to maintain a 3.0 overall GPA and a 3.0 STEMM GPA. | Priority application deadline is December 1, 2018; applications will be considered through March 1, 2019. | Learn more and apply. An application is required for this scholarship, which is awarded to an outstanding incoming freshman who intends to pursue a major in Chemistry. It is renewable annually as long as the recipient continues their study of Chemistry with a GPA of 3.0 or better. An application is required. Awarded to an incoming Freshman planning to study in English with an interest in creative writing, a HS GPA of 3.4 or SAT above 1100. Presented to a major in mathematics, chemistry, physics, or biology, the recipient must be a National Merit Scholarship finalist/semi-finalist or have a minimum ACT composite score of 27. Application required. Independent of financial need and renewable each year upon maintaining satisfactory progress (GPA of at least 2.75) toward a degree offered by the Department of Mathematics and Computer Science: Bachelor of Science in Mathematics, Bachelor of Science in Computer Science, Bachelor of Science in Computer Science with Healthcare Information Technology, Bachelor of Science in Data Science, or Bachelor of Arts in Teaching Mathematics. An application is required for this scholarship, which is awarded to outstanding incoming freshmen with high academic achievement who intend to pursue a major in Physics or Engineering Physics. Students interested in the 3-2 Engineering program are also eligible. It is renewable annually as long as the recipient continues to pursue a major in the Physics Department with a GPA of 3.0 or higher. John Carroll University students pursuing science and technology majors may now apply for Molding Identity & Raising Retention through Opportunities for Reflection In STEM (MIRRORS) scholarships. These scholarships, funded from the National Science Foundation’s Scholarships in Science, Technology, Engineering and Mathematics (S-STEM) program, will provide up to $4,000 per year to low-income students with significant demonstrated financial need and academic promise to succeed in STEM disciplines (any major in any of the following departments: Biology, Chemistry, Mathematics & Computer Science, and Physics) at JCU. Students must also be U.S. citizens. Scholarships are renewable for students who continue to meet eligibility requirements. | Priority application deadline is December 1, 2018; applications will be considered through March 1, 2019. | Learn more and apply. This scholarship is awarded to an incoming freshman who is a graduate of St. Vincent-St. Mary’s High School in Akron, Ohio. Awarded to an Orville High School graduate with a 2.75 GPA and evidence of leadership. Candidates from Archbishop Hoban, St. Vincent/Mary or Canton Central Catholic will also be considered. The Brian & Jane Mortellaro Scholarship is awarded yearly to one student from Guernsey, Muskingum, Knox, Franklin, Licking, Morrow, or Holmes Counties in Ohio. Provided to a student from the Columbus/Central Ohio area, the recipient must have a min GPA of 2.75, an inspiring attitude, a positive influence on peers, and provide service to others. This scholarship is intended for an individual from the Chicago area who has proven that they will be a leader while at JCU. There is no minimum GPA to receive or renew the scholarship. Separate application required. For more information, please contact your enrollment manager. This scholarship is given to a student from any Catholic high school in Chicago, Illinois. Special consideration given to those students from Loyola Academy High School with a min GPA of 2.75. Awarded to student from Fenwick High School in Chicago who exhibits strong leadership. Preference given to a student with financial need. The Loyola Academy Scholarship was created to recognize the academic excellence of a Loyola Academy student who represents the characteristics of Ignatian heritage and is committed to Jesuit education. The $30,000 annual scholarship is awarded to a student with ACT score of at least 27, combined with a 90 or higher on the Loyola Academy unweighted 100 point-scale and evidence of leadership and service. Separate application required. For more information, please contact your enrollment manager. Offered to an entering female from St. Viator High School and/or Mother McAuley High School. This scholarship is awarded to a graduate of Leo Catholic H.S. in Chicago, IL or any Cristo Rey school. The recipient must have a min 2.8 GPA and demonstrated leadership qualities. The Thomas M. Tully Family Scholarship is for an entering graduate from St. Ignatius College Prep. Scholarship is $25,000 per year for 4 years for one student. 2.75 required for renewal. Separate application required. For more information, please contact your enrollment manager. This is to an incoming freshmen from Benedictine with need each year and renewed all four years. This scholarship is awarded to a graduate of Benedictine High School. This scholarship is made available to students from the greater Cleveland area who have shown extracurricular and leadership involvement. This is awarded to a resident of Cleveland with a minimum GPA of 2.8 at a Cleveland public high school or a high school in the Cleveland Diocese who desires to become a teacher. This scholarship is intended for a student from Detroit, Michigan with unmet financial need. This award is given to a graduate of Warren JFK High School in Youngstown, OH who has a minimum 2.50 GPA and has demonstrated leadership qualities. This scholarship is awarded to an incoming freshman from the state of Ohio who is planning on majoring in biology, chemistry, or physics. Preference is provided to those from the Mansfield area. This award is utilized to provide a scholarship for students from St. Mary Central Catholic High School in Sandusky, Ohio with a minimum GPA of 3.25. This award is available to a graduate of Erie Cathedral Preparatory School who has maintained a minimum GPA of 3.0, ACT of 24, and SAT of 1000. This scholarship is presented to a student from the Pittsburgh, PA area with strong academic credentials and unmet financial need. Mastrantoni Scholarship designated for students from western NY who present the greatest financial need. Preference given to graduates of St. Francis HS. This scholarship provides financial support to students demonstrating financial need from Buffalo or Western New York. This scholarship is awarded to an incoming freshman with unmet need, based on appeal. Funds from this scholarship are awarded to an incoming freshman with unmet need. This fund is awarded to families with a special circumstance who file an appeal. An application is required. This award is available to an incoming freshman who is a child or relative of a member of the class of 1964. The Class of 64 will reach out to their class members to solicit nominations and the committee will choose the recipient. This scholarship is awarded to a freshman with a 2.75 minimum GPA who has a proven history of involvement in extracurricular activities and evidence of leadership. An application is required. This scholarship is awarded to a son, daughter, niece, nephew, or grandchild of a member of Iota Chi Upsilon. An application is required. This award is presented to a student whose parents have exhibited a life-long commitment to Catholic education either by teaching, volunteering, and/or any other similar form of service. An application is required. Open to any US high school graduate with a min GPA of 2.75, involvement in extracurricular activities, and evidence of leadership. Priority given to a relative of the JCU football teams from 1959-1963. This award is provided to one incoming freshman per year who has proven himself or herself to have the highest of academic credentials. Awarded to a well-rounded student with the greatest need, working to fund their education. This scholarship is awarded to an incoming freshman and is based on academic merit and financial need. This scholarship is awarded to an incoming freshman based on academic merit and financial need. This scholarship is provided to an incoming freshman with extraordinary unmet need. An application is required. This is awarded to a child, grandchild, or step-child of a Diplomatic Security Service special agent. Recipient must have a minimum 2.8 GPA in high school with strong SAT and ACT scores. Thomas Gibbons ’49 Scholarship is awarded to an incoming freshman with financial need and is renewable throughout their four years at JCU.